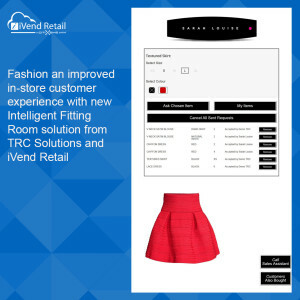 18 February 2016 – Watlington, Oxfordshire, UK: Leading omnichannel retail systems provider, iVend Retail, has partnered with IT services provider, TRC Solutions, to offer a new Intelligent Fitting Room solution for fashion retailers. Digitalising the in-store customer experience, the innovative Intelligent Fitting Room Solution allows retailers to deliver the personalised and seamless journeys which today’s digitally enabled, omnichannel shoppers have come to expect and drive increased conversions. Using radio frequency identification (RFID) technology, the solution automatically detects the garments, which have been brought into the changing room. Touchscreen displays in the dressing room booths then enable the customer to request different sizes or colours of the products they have selected to try on. The customer can also ask for personal assistance from a fitting room attendant at the swipe of a touchscreen, thanks to real-time two way communications between the in-fitting room digital display and the changing room attendants’ mobile devices. The Intelligent Fitting Room solution will also display additional garments and accessories, which complement the items the shopper has already brought into the fitting room, presenting up-selling and cross-selling opportunities to boost additional sales. Further to this, by analysis of popular product selections made by consumers through the Intelligent Fitting Room solution, retailers can apply this insight to their merchandising strategies, streamlining stock ordering, replenishment, planning and buying processes. TRC Solutions and iVend Retail will be demonstrating the new Intelligent Fitting Room technology at RBTE, Europe’s biggest retail technology expo, in London on 9th and 10th March 2016 on Stand 520.